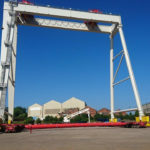 As part of the development of their facilities in North East of England, Smulders Projects, who produce offshore wind farm jacket foundations, planned to install two gantry cranes capable of lifting 540t each. 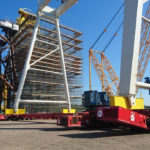 Specialist contractor, ALE Heavylift, was awarded the mammoth tasks of moving the gantry cranes into position, using their own self-propelled modular trailers (SPMTs). ALE required 2 No. 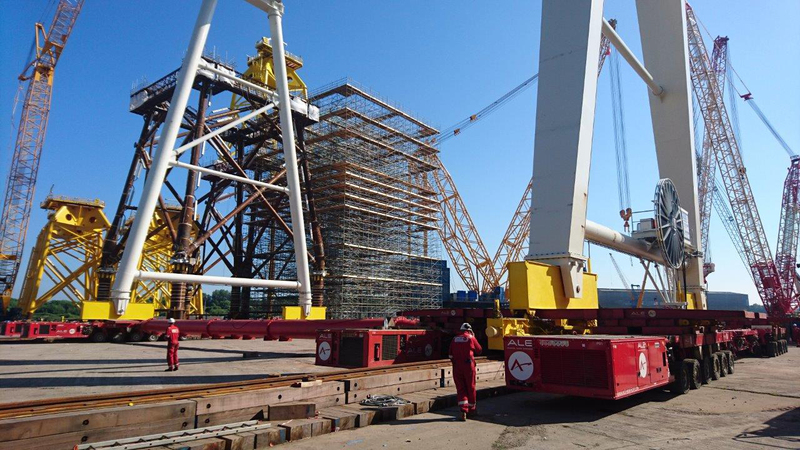 32.27m 1000 series props as a contingency measure to ensure the SPMTs positions were maintained during transport. After spotting MGF’s 1000 series struts in a magazine article, Richard Johnston, Lead Engineer for ALE, contacted MGF for the job. It was ALE’s preference not to have hydraulic components in the prop, therefore a fixed distance had to be achieved using the 1000 Series Props. 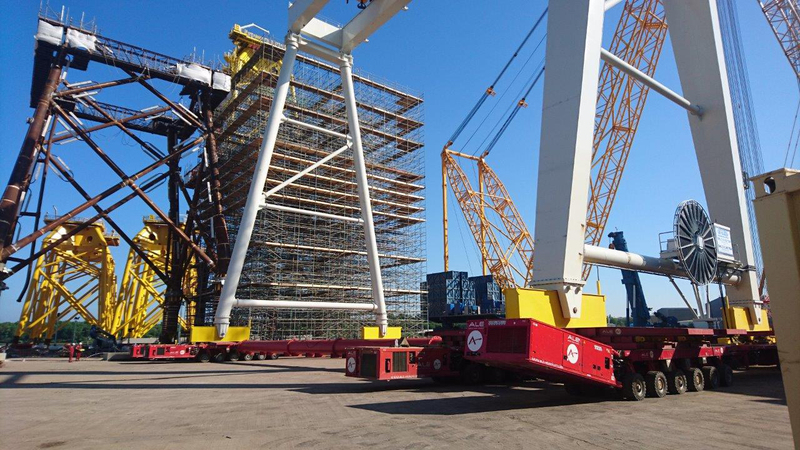 ALE only had +/- 50mm tolerance regarding the trailer spacing, therefore, close communication was required between ALE and MGF Design to ensure the correct prop length was achieved. 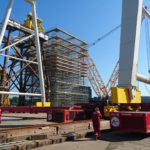 Hypothetical axial compressions and tension loads were calculated at 176kN and design calculations were provided by MGF to prove the props would work in such an application. ALE own a fleet of props for similar applications, however they were unavailable for the job. Hiring props avoided disruption, reduced and saved costs from the fabrication of new props. 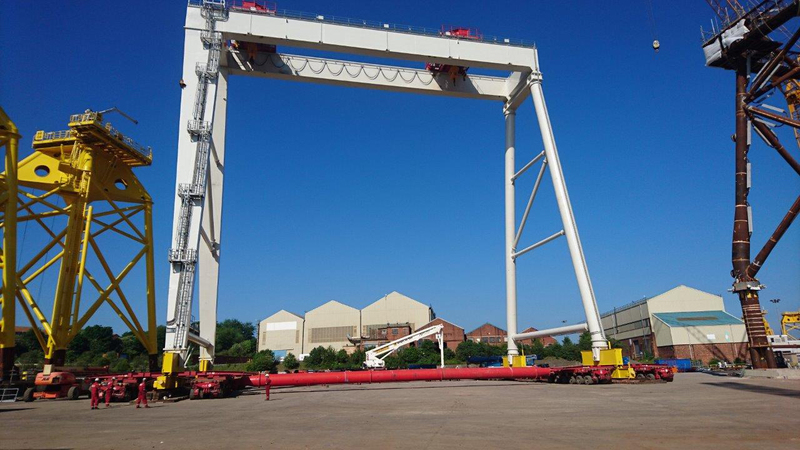 MGF received great feedback from the design, equipment and service they received from Joel, and arranged for the props to be reused for a second gantry crane move later in the year.